How the hell did I end up at JR Monaghan’s? I can’t even get into it, but I can tell you about these cheese steak freakin egg rolls which were about some of the greatest appetizers I’ve ever eaten in m life. It is an egg roll wrapped stuffed with grilled chipped steak, sweet onions, jack and cheddar cheese, and served with a spicy ketchup. Ok, it might sound kind of gross, but it’s totally not. They’re totally amazing and I’m dying that I’ve never had them before until now. Who cares that these are obviously beyond terrible for you. They will knock your socks off. I’m in love with these. 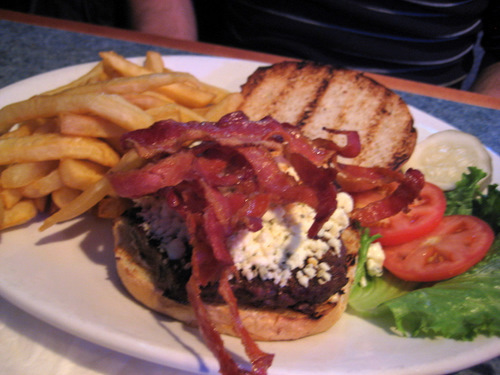 R’s Black and Bleu Burger, cajun spiced with crumbled bleu cheese. The cajun spice sounds fine, but I hate anything with stinky cheese. That sure is a lot of bacon! I got the french onion burger, so it was like french onion soup topped onto a burger. 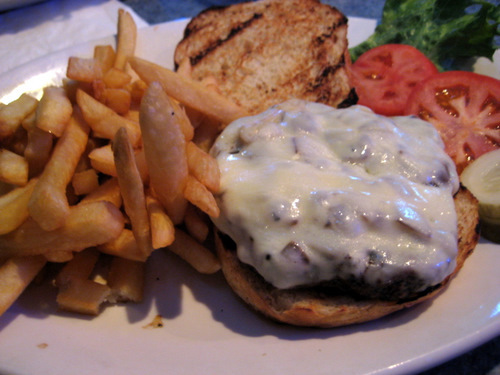 This was a good burger! And it was a tuesday night, so it was buy one burger, get the other half price. So for all your suburban recessionistas, here you go! The fries were only alright. But who cares, because this place is awesome solely for their cheese steak egg rolls. I’m sold! 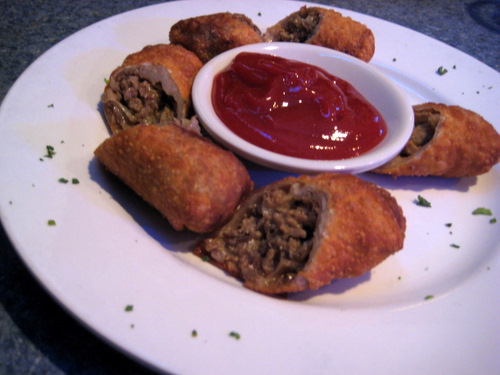 Oh, it is way too early for me to be craving cheesesteak egg rolls!